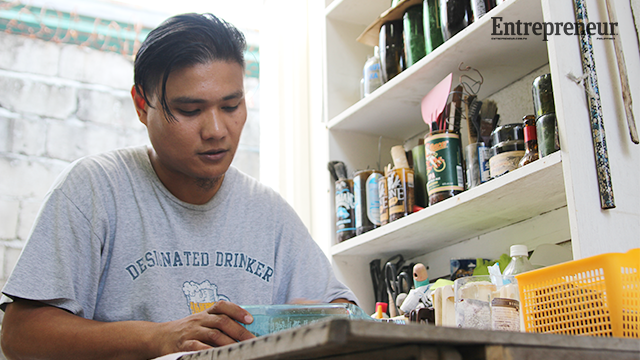 A resignation can either be seen as a glass half-empty or half-full, but for the former BPO-employee Ron Cristal, he only saw it as the perfect time to tinker with his glass bottles, not knowing he’ll make a fortune out of it. A long-time bottle collector, Cristal admits he loves drinking, as much as he loves the perfectly molded bottles that contain his favorite intoxicating drinks. He has an impressive collection, ranging from the first bottle of wine he and his wife shared, down to gifts from family and friends. “I started collecting when I was in college. So when I was jobless, I had all the time in the world, and with no money, I figured, there must be something I can do out of these [bottles],” Cristal told Entrepreneur Philippines. His circumstances may have been the perfect factors to heat up his imagination. He scoured Youtube for some videos that can teach him how to create lamps and tumblers out of the used bottles he already own. 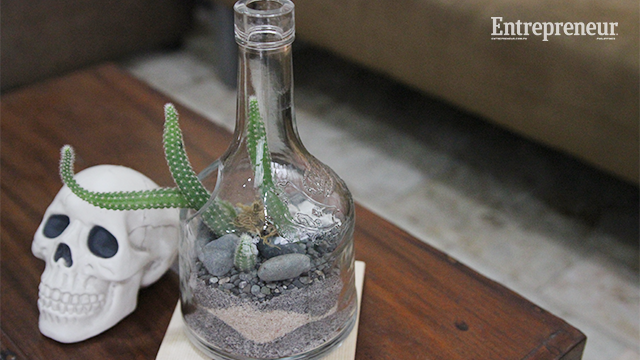 The results were bottle shards, half-cut wine bottles and one fully-functioning pendant lamp. In March 2014, The Cristal Glass Project was born. “My wife pushed me to post my ‘projects’ online. Later on, friends and family started to notice what I do and then I would even give away some of glass tumblers since I didn’t consider it a business – it was more for fun,” Cristal said. Using his own makeshift bottle cutter, Cristal started his side gig with tools he already owned in his backyard. After all, it was only meant to be a pastime. But one summer day in May 2014, Cristal received an inquiry from a resort manager if he makes lamps out of decanters. At that time, the newbie glass artisan still hasn’t tried cutting a bottle with such shape, for one, because such bottles are rare finds. Still, he didn’t turn the client down. ‘What does he have to lose?’ he thought. Cristal went from Quiapo to Dapitan Arcade looking for such bottles. He went home with one sack. “When I showed them what I did, they happened to like it. Their initial order were only 20 lamps. After seeing my design, they added 20 more. I was overwhelmed,” Cristal said. For the rookie craftsman, this was his first formal order. While the gig earned him more than Php 50,000, it wasn’t until 2015 when he joined his first bazaar, formally introducing himself to the public as The Cristal Glass Shop. After nine months of unemployment, Cristal was back in the corporate world but his fascination for upcycling never faltered. In fact, it was only rejuvenated by the stream of orders he got in December 2014. The Christmas season, after all, is when businesses are at their peak. Onlookers either scoffed at his works or were purely interested with a follow-up question of: how did you do it? The latter kept him engaged enough to join another bazaar in Alabang. By June of last year, he found his market. The two bazaars taught Cristal that, foremost, the market wants something local. 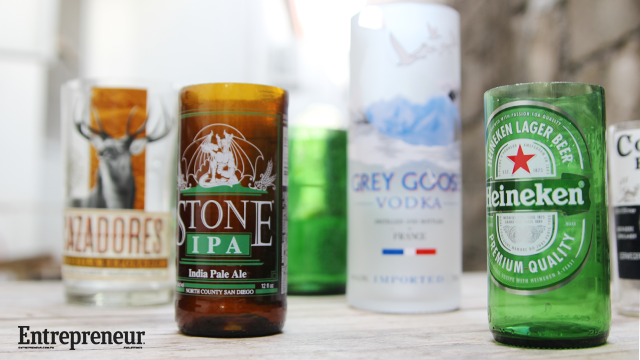 During his first outing, most of his glass tumblers were made from foreign and imported bottles, brands that most shoppers didn’t recognize. The second lesson: he can only do so much. Equipped with guts and gusto, Cristal then phoned different bars in the metro which were willing to give him the used bottles their establishments no longer need. The thing about trying is, after a while, the rejections thin out, and eventually, you’ll hit a jackpot. Cristal chanced upon a Mexican-themed event that gave him unlimited supply of beer bottles, for a while, since the organizers also happened to own a bar. But even with tens of sacks full of bottles, Cristal only had two hands and two days a week to build inventory. 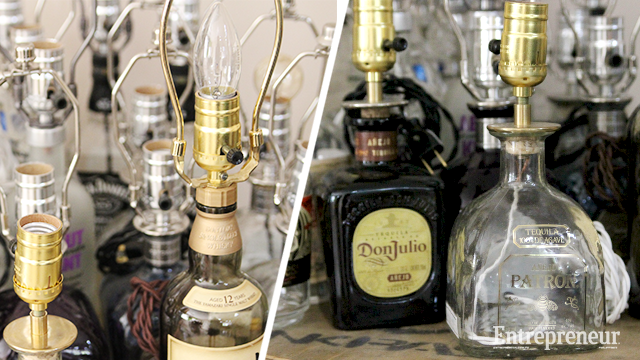 For months, he dedicated his weekends to creating more bottle tumblers and lamps. While his was the sole business which did glass upcycling for a while, Cristal knew he would have competitors soon enough. So he started to experiment on designs and added to his collection designs such as bottle clocks, ashtrays and pots for indoor plants. To keep a certain quality, he also began to invest on certain equipment. “Even when I was the only one doing it for a while, I wanted to set a certain standard with my work. I wanted to be proud of showcasing my collection, not only to make a sale out of their interest in what I do,” Cristal said. So when Common Room invited him again for a Christmas pop-up, Cristal thought his inventories were more than ready for the holiday rush. And boy, was he wrong. Not even lasting a week, his three-month worth of inventories were already sold-out on the first week of December 2015. That kept on even until January of this year. Cristal estimates that in 2015, he probably made Php 150,000 worth of gross sales, and that’s only out of his love for bottles. When Cristal left his corporate job, he did so because he didn’t want to take over his family’s exporting business. His father was pushing him to take charge eventually, but knowing he wouldn’t be best for the job, he had to step away. But after almost two years of raket as he called it, The Cristal Glass Shop somehow gave him the idea of the path he would love to take. Eventually, the craftsman wants to have his own glass recycling facility that can make different products out of the waste he collects for upcycling. He envisions that it can produce new bottles, construction materials and even granite. “I have so much bottle wastes that for me, my work still isn’t done. There’s still so much potential in glass. And I feel I’m still in a trial and error stage,” Cristal humbly expressed. 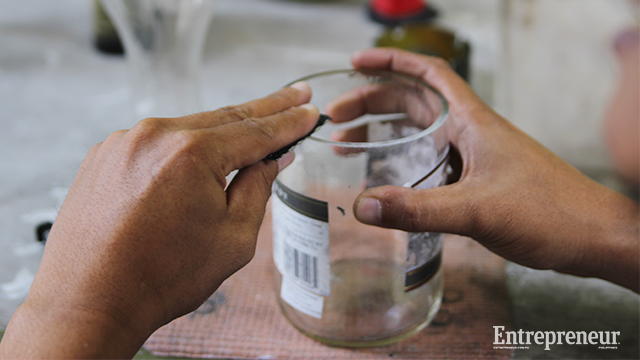 One of the final stages in the glass upcycling process is the sanding of the glass bottle’s sharp edges. This isn’t the hardest part, but ultimately the most time-consuming stage since the process can either take from 10 minutes to an hour, depending on a bottle’s thickness. Cristal now supplies his crafts to four different locations in the metro and still, with only him running the show. But unlike the past year, he now has more inventories stocked, and operates under a better strategy. Cristal’s entrepreneurial life may be at its 30th minute-mark of sanding.